Since the beginning of May, you may have noticed that a number of brightly coloured elephants have appeared around the streets of London. 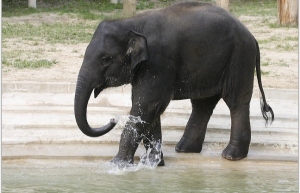 As well as being an interesting attraction for tourists and commuters, the elephants are there to raise an important issue – the future of the endangered Asian elephants. As one of the world’s largest mammals, Asian elephants understandably need lots of room to roam. There are over 30,000 Asian elephants left in the wild and their habitats are getting smaller and sparser. With the worlds’ population increasing rapidly, the elephants’ habitat is slowly disappearing and this is causing hostility between elephants and local communities. 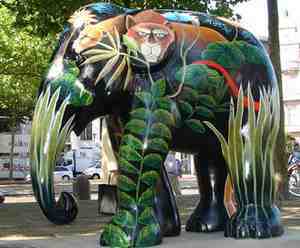 This is the fourth, annual elephant parade and also the largest. The first parade in Rotterdam in 2007 showcased 50 elephants, seventy appeared in Antwerp the year after, over 100 elephants graced the streets of Amsterdam in 2009 and this year, running simultaneously with the London parade, is one in Dierenpark Emmen in the Netherlands. The London Elephant Parade has been organised by the charity, Elephant Family to raise both awareness and money for the cause. 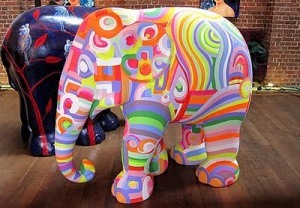 Organisers hope to raise around £2million from the 260 elephants, which have been designed by artists and celebrities, and will be sold individually at auction. For those of us who are unable to house an elephant ourselves, we are able to purchase mini elephants from the Elephant Parade Online Shop. You can get involved in lots of other ways too, by signing the petition, donating money on the website, buying mini (or life size…) elephants, texting ‘elephant’ to 83118 and more! The money raised goes towards securing ‘corridors’, ancient migratory routes that the elephants and other herds use to find new forests and fresh supplies of food and also moving entire villages out of the elephants’ way. On May 22nd, the artists behind the eye-catching elephants will be standing proudly beside their elephants between 10am and 1pm to answer your questions and discuss their inspiration for the designs. The elephants are in London until July 4th so get up to London, download the map from the website and get elephant spotting! It is such a worthwhile cause and even the smallest donation can help to make a big difference. Thanks for a super guest blog, Laura!